Free Pattern: Monogram for Hand Embroidery – The Real C! Sorry about that big blunder yesterday! If you want to embroider a “C” on something, here’s the design for the monogram! In case you’re debating how to transfer your monogram to your fabric before embroidering it, there are a number of ways to do that. For the oatmean colored guest towel I embroidered, I used an iron-on transfer, so I didn’t really have to deal with that issue. When you’re printing a design, though, you do. I find the most accurate way to get a pattern down for a project is to trace it. If you don’t have a light box, use a sunny window, taping your pattern to the window and your fabric on top of your pattern. Use a regular #2 pencil and trace it lightly. If you’re sure the design will be completely covered by your stitching, after you’ve traced it with the pencil, you can go over it with a fine-tipped micron art pen. The pencil will wash out! I generally starch my fabric and iron it well before tracing on it with a pencil, and the pencil always washes out. The pen will not wash out. Anyway, I know I harp on the design transfer point a lot. It’s one of those questions I get asked a lot! Here’s the C – yes, it’s the C!! This design was pretty messy, so you can probably tell where I’ve reconstructed some of the lines. I probably should have just reconstructed (redrawn) the whole thing! For other monograms, check out the Index of Monograms for Hand Embroidery! Thanks for this wonderfull website, it is helpfull. I was wondering if you could tell me about a decorative stitch called “mulberry stitch” ? My grandmother mentioned it but she cannot remember how to do it, I was hoping you would !Thankyou. Shallia – I’ll have to look it up. When I get a chance, I’ll look it up and let you know if I find it…. Thankyou so much, I hope you can find it. I really appreciate the fact that you actually replied , it means alot!! Love the website!!!! 🙂 Keep it up! Thanks A ton Mary! I so need a C for a gift I am making. Your a peach! I look forward to hearing from you everyday. Don’t know how you find the time! hola..como hago para encontrar mas letras! I want to make this monogram pattern and I wanted to know which type of stitching do you think will be best for it? Sou psicotrapeuta e nas horas de descanso tanto para o relaxamento quanto para o trabalho voluntário, onde as peças são feitas e vendidas para arrecadação de dinheiro necessidades de crianças desde enxoval até qualquer necessidade. Somos um grupo de cinco a oito pessoas. Meus sinceros e gratos agradecimentos em nosso nome. Bençãos de Luz. 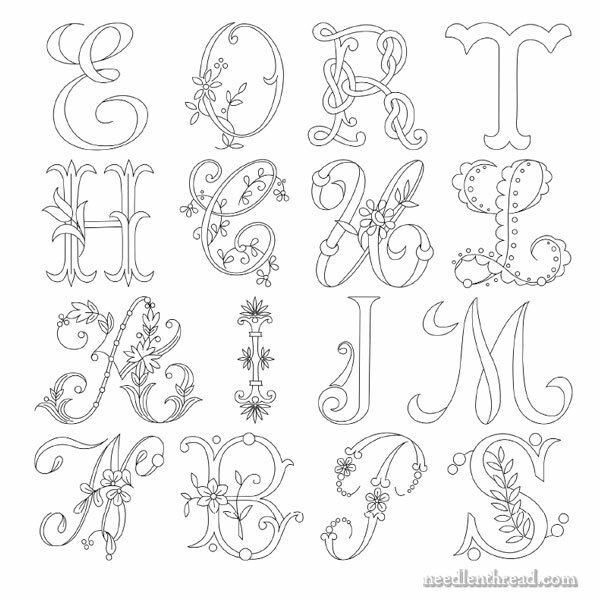 Previous Previous post: Great New Embroidery Resource – for Free!